Bastrop was established as a Mexican municipality (later renamed Mina) in 1832. As in many Texas towns, early 20th century grade schools here were segregated into three campuses, with separate facilities for Mexican American, African American and Anglo American students. 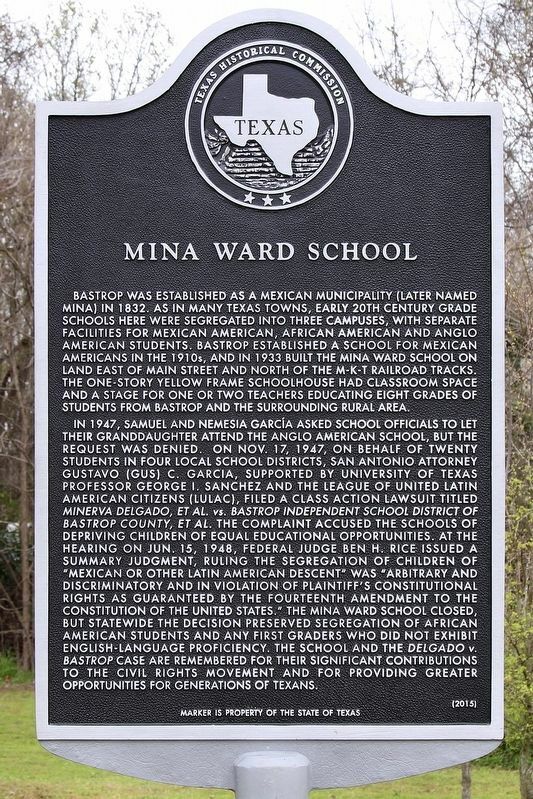 Bastrop established a school for Mexican Americans in the 1910s, and in 1933 built the Mina Ward School on land east of Main Street and north of the M-K-T railroad tracks. The one-story yellow frame schoolhouse had classroom space and a stage for one or two teachers educating eight grades of students from Bastrop and the surrounding rural area. the schools of depriving children of equal educational opportunities. At the hearing on Jun. 15, 1948, federal judge Ben H. Rice issued a summary judgment, ruling the segregation of children of "Mexican or other Latin American descent" was "arbitrary and discriminatory and in violation of plaintiff's constiutional rights as guaranteed by the Fourteenth Amendment to the Constitution of the United States." The Mina Ward School closed, but statewide the decision preserved segregation of African American students and any first graders who did not exhibit English-language proficiency. The school and the Delgado v. Bastrop case are remembered for their significant contributions to the Civil Rights movement and for providing greater opportunities for generations of Texans. Location. 30° 7.268′ N, 97° 19.211′ W. Marker is in Bastrop, Texas, in Bastrop County. Marker is at the intersection of Main Street and Hawthorn Street, on the right when traveling north on Main Street. Touch for map. Marker is at or near this postal address: 1903 Main Street, Bastrop TX 78602, United States of America. Touch for directions. Other nearby markers. At least 8 other markers are within walking distance of this marker. H. P. Luckett House (approx. 0.4 miles away); Site of Bastrop Military Institute (approx. 0.4 miles away); First Baptist Church of Bastrop (approx. 0.6 miles away); First National Bank of Bastrop (approx. 0.7 miles away); The Bastrop Advertiser (approx. 0.8 miles away); Home Town of Texas Confederate Major Joseph D. Sayers (approx. 0.8 miles away); Baron de Bastrop Monument (approx. 0.8 miles away); Bastrop County Jail (approx. 0.8 miles away). Touch for a list and map of all markers in Bastrop. More. Search the internet for Mina Ward School. Credits. This page was last revised on March 11, 2019. This page originally submitted on March 8, 2019, by Larry D. Moore of Del Valle, Texas. This page has been viewed 59 times since then. 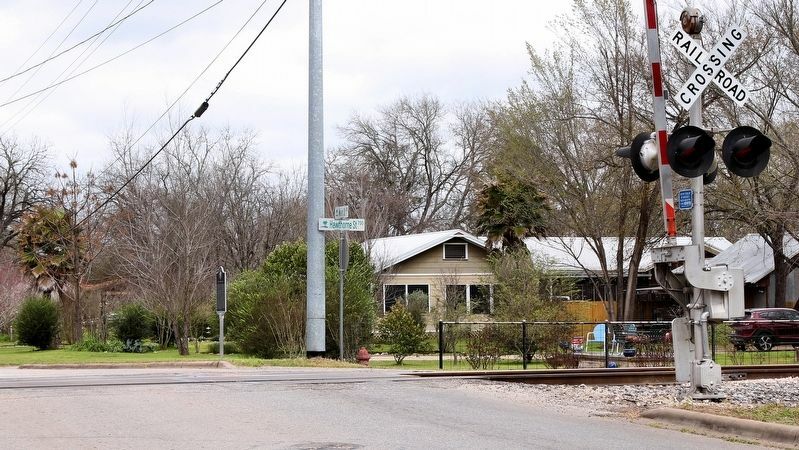 Photos: 1, 2. submitted on March 8, 2019, by Larry D. Moore of Del Valle, Texas. • Andrew Ruppenstein was the editor who published this page.